Unbelievably we have now entered 2018 although it seems only yesterday that everyone was preparing for the Millennium celebrations. On a personal level I am happy to say that so far I have lived up to my New Years resolution of attending the gym more regularly, although the fact that it is only the third week of January does put this achievement into perspective. At Council a lot of time is being devoted to the Budget process which will lead to a Council Budget for 2018 to 2019 being decided. Budget day is scheduled for the 15th February. It is a new experience for me being part of the Opposition Group at Council and we will have to see what the new Conservative led Administration chooses to do with their Budget proposals. As part of the SNP Opposition Group I know that we will have different ideas as to what our spending priorities would be however, I know that for Councillors of all political hues that this is a difficult period, with budgetary constraints and know that none of us make any decisions lightly. I am happy to say that discussions between Perth & Kinross car parking Officers and the Post Office have led to the provision of a mobile service coming to Dunkeld. This will be provided by a Post Office liveried vehicle which will park in the North car park. Initially this will be for a three month trial period beginning in March, dates and times will be confirmed and widely advertised. This will enable the Post Office to continue their search for a permanent location in Dunkeld. If any retailer thinks that their premises and business would be a good fit with and could accommodate the Post Office I would urge them to contact the Post Office direct. On January 8th I attended a Community Council hosted event on A9 Dualling which was very well attended. It gave an update on how the whole Dualling planning process for the section from the pass of Birnam to Jubilee Bridge has changed over the last three years and resulted in this ground-breaking, innovative situation we now find ourselves at. 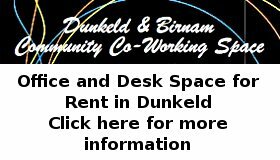 This has been achieved through the hard work of members from within our own community of Dunkeld & Birnam. I urge everyone with an interest in finding a safe, sensible and sustainable solution to engage in the co-creative process which has been set up and to feed their ideas into it. We should all encourage our children and grandchildren to take part as they will be the ones who will live and drive with the new dualled A9 in the years to come. The Council unanimously supported a motion to voice our concern over proposed RBS branch closures in Perth & Kinross. I fear if this goes unchallenged it could set a precedent for other national businesses to make cuts to local services. Looking forward to adopting five more rescue hens this weekend although I don’t know if they will be thanking me for subjecting them to a free-range existence in this weather after spending their short life so far indoors in an intensive egg laying facility. On the subject of birds and the wintery weather I hope everyone is feeding and watering our wild garden birds. Sitting at the Butterstone Burns Supper back in January, I was struck again by the way some of Burns’ lines can say, in a few words, something that we all have felt. There are a couple in Tam O’Shanter which always stand out for me – when Tam’s wife is at home waiting for him she is described as ‘nursing her wrath to keep it warm.’ We recognise there something we have all done (or experienced from others!) Later in the poem are the profound lines ‘But pleasures are like poppies spread, you seize the flower, it’s bloom is shed, or like the snow falls in the river, a moment white then melts forever.’ How well that expresses the transient nature of material things. That is what poets do. They find a form of words to express something recognisable in life experience – it is just that most of us can’t say it as pithily as they can. As we grow older it becomes easier to see these things because the more we experience of life the more we recognise the truth they express. Like many folk I well remember having poetry drummed into me at school and most of it went right over my head. (It shows the truth of the old adage ‘education is a resource wasted on the young!’) I feel I would get so much more out of it now having a bit more life experience. ‘Then the peace of God which is beyond all understanding, will guard your hearts and your thoughts in Christ Jesus.’ Perhaps for a long time we wonder what on earth that means and then we experience a moment of near despair, we put our trust in him and we discover its truth for ourselves as we find that peace of God which is beyond understanding. If that is true of things we experience here and now, I believe it is equally true that the Bible speaks of things to come which we do not yet understand or see, but for now, can only guess at. One day though, at the end of our journey, we will see and know for ourselves. Having come this far and discovered so much already, perhaps we should learn to trust him more. I have decided to embrace winter. It’s all the thing these days. Very fashionable indeed. ‘Hygge’ is the word for it which apparently is pronounced something like the sound you make when you are clearing your throat. The word is Danish in origin and let’s just remember that the Danes burn more candles than any other nation on earth – so that gets them a lot of Hygge points straight away. To get into the hygge mentality we must think about things like warm woolly socks and lying in front of the fire roasting chestnuts. We must spurn things that are annoying or emotionally overwhelming and instead embrace the peace of the mid-winter. Maybe think of that sound outside after snow has fallen – all sort of muffly. And make your brain go like that (and if there’s no snow try a large gin – it has the same effect.) Ah! now I’m getting there. But then a jolt. A cold un-hyggey jolt. There’s all the Christmas preparations to get done in my new hyper-Hygge state before I can sail through to spring. Perhaps others of you share that Christmas ‘blip’ – most un-Hygge – far too much stress and rushing about. So let’s take the Christmas Hygge challenge. How can we manage it all in a stress free way? How about shopping locally for starters. Let’s buy lots of our gifts on Santa Day. New this year is the craft stall in the Taybank carpark. All our wonderful local shops will be open as well as the charity stalls in the square. Let’s buy a glass of mulled wine or a warming cup of hot chocolate and wander round in a sort of tranced Hygge kind of way – peacefully gathering gifts. I’m sure it’s also very Hyggey (have I just invented a new word?) to give to charity. One really good way is to rake through the cupboard for good quality toys and get those donated to the Santa day charity toy stall. Alternatively, if you have grandchildren coming to stay over the hols why not get down to the toy stall on the 9th in the Duchess Anne and update your toy selection. Regular readers of this column will know that my Christmas isn’t complete until I have watched Gregory Peck in the Guns of Navarone. Considering I always do this in front of the fire with a glass of sloe gin I’m wondering if I can count viewing a war movie as Hyggey or not? I think …on balance …I can – for while Mr Peck might be emotionally overwhelming he’s certainly not annoying. On behalf of John and myself may I wish all you wonderful readers a very Hyggey Christmas and a Happy and Successful 2018. Thank you so much for all your support over the past year. I look forward to catching up in February when the snowdrops will be out and spring will be on the way. Skål!